Marvel Comics Universe & June 2019 Solicitations Spoilers: Frank Miller’s Storied Daredevil Run Collected In Massive New Box Set! Marvel Comics Universe and June 2019 Solicitations Spoilers follows. 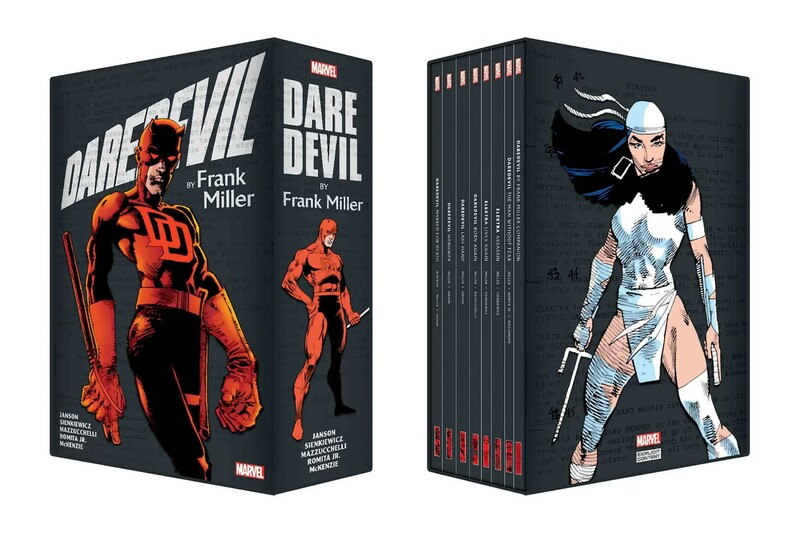 Frank Miller’s Storied Daredevil Run Collected In Massive New Box Set! Solicitation and covers below. Penciled by FRANK MILLER, KLAUS JANSON, JOHN BUSCEMA, DAVID MAZZUCCHELLI, BILL SIENKIEWICZ & JOHN ROMITA JR.
Visionary creator Frank Miller’s complete saga of Matt Murdock and his first love, the lethal assassin Elektra Natchios — in a single, exhilarating box set! In one of the greatest runs not just in Daredevil history, but in all of comics, Miller also introduced Stick and the Hand to the DD mythos, and established the Kingpin and his sadistic marksman Bullseye as Matt’s deadliest foes. Plus: the stunning graphic novel LOVE & WAR, Miller’s revolutionary revisit of the Man Without Fear’s origin, the startling continuation of Elektra’s story and more! Collecting DAREDEVIL: MARKED FOR DEATH TPB (NEW PRINTING), DAREDEVIL: GANGWAR TPB (NEW PRINTING), DAREDEVIL: LAST HAND TPB, DAREDEVIL: BORN AGAIN TPB (NEW PRINTING), ELEKTRA LIVES AGAIN TPB (NEW PRINTING), ELEKTRA: ASSASSIN TPB (NEW PRINTING), DAREDEVIL: THE MAN WITHOUT FEAR TPB (NEW PRINTING), DAREDEVIL BY FRANK MILLER COMPANION TPB and DAREDEVIL BY FRANK MILLER BOX SET SLIPCASE POSTER.